Exolon was a great (if not at all easy!) 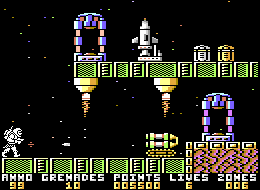 game, released by Hewson in 1987. Featuring some really neat colourful graphics and gameplay, it's well worth putting some time into.